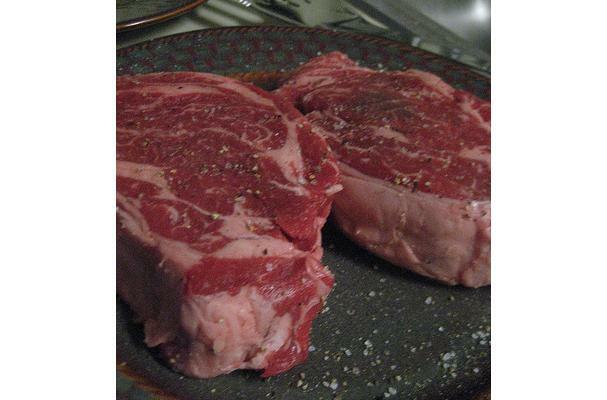 Beef Chuck is a part of the subprimal cut known as a chuck. Chuck sections come from the shoulder and neck of the beef. This steak is tougher than other cuts and primarily used for braising. This primal cut is often fabricated into other cuts which include Chuck Shortribs, Cubed Steaks, Ground Chuck and Shoulder Clod. Though considered of lower quality and usually sold at a lower price, chuck is also very flavorful and makes and excellent stew meat, hamburger, or pot roast. Usually chuck steaks are cut in square shapes. They will resemble other cuts of steak, but are more noticeably cut thicker with more white connective tissue weaving through the meat than other, leaner cuts. Flavors: Retains flavors nicely. Enhanced when cooked in stews. Fat adds more intense flavor. Mouthfeel: If braised or stewed, Meat should be easy to bite into, Not chewy. Food complements: Stews. great with rice or potatoes. Choosing: Choose cut with as little grissel as possible. Shoudl be approximately 1-2" in thickness for most stews or braising methods. Buying: Found in almost every grocery store, this economic cut boasts great flavor, much like a Rib eye, but less expensive. Procuring: Cattle are domesticated and raised on farms. They are not wild. Containing lots of connective tissue, when cooked the collagen partially melts into the meat, making the flavor very strong. Best in stews or when braised to capture the juice. If grilled or broiled, meat should be marinated overnight for tenderness. Cleaning: Rinse after opening from packaging. Trim extra fat. If cubing, more trimming can be done when cutting it down. Freeze after purchasing. Let defrost in fridge for 2 days. Cook fresh meat within 3-4 days of purchase. History: Cuts first perfected in Europe before cattle was introduced to the US.